Ultraviolet disinfection systems are curious to many people – how can “light” kill bacteria? But the truth is, it can. Ultraviolet (UV) technology has been around for 50 years, and its effectiveness has been well documented both scientifically and commercially. It is nature’s own purification disinfection method. With consumers becoming more concerned about the negative effects of chlorine and other chemical contamination of swimming, play water parks, and fountain water, informed consumers are seeking an ultraviolet solution suitable for both small residential applications as well as medium to large flow commercial projects. Ultraviolet is a means of killing or rendering harmless 99.9% of microorganisms in a dedicated environment. These microorganisms can range from bacteria and viruses to algae and protozoa. UV disinfections are used in air and water purification, medical sterilization, food and beverages, sewage treatment plants, and many other disinfectant sterilization applications. A major advantage of ultraviolet treatment is that it is capable of disinfecting water faster than chlorine without cumbersome retention tanks and harmful chemicals. UV treatment systems are also extremely cost efficient! What is UV and how does it work? Ultraviolet is one energy region of the electromagnetic spectrum, which lies between the x-ray region and the visible region. UV itself lies in the ranges of 200 nanometers (nm) to 390 nanometers (nm). Optimum UV germicidal action occurs at 260 nm. Since natural germicidal UV from the sun is screened out of the earth’s atmosphere, we must look to alternative means of producing UV light. This is accomplished through the conversion of electrical energy in a low-pressure mercury vapor “hard glass” quartz lamp. Electrons flow through the ionized mercury vapor between the electrodes of the lamp, which then creates UV light. 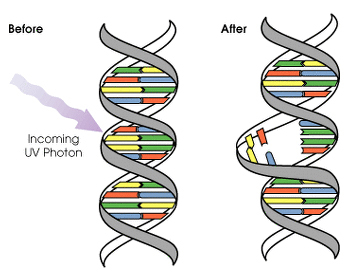 As UV light penetrates through the cell wall and cytoplasmic membrane, it causes a molecular rearrangement of the microorganism’s DNA, which prevents it from reproducing. If the cell cannot reproduce, it is considered dead. Light is electromagnetic radiation or radiant energy traveling in the form of waves. Ultraviolet (UV) energy is found in the electromagnetic spectrum between visible light and x-rays and can best be described as invisible radiation. The energy employed for UV water treatment is further categorized into two primary levels measured as wavelengths – 254nm and 185nm, where nm = 1/1000 of a micron. For disinfection and ozone destruction applications, the 254nm wavelength is utilized. For TOC reduction and chlorine destruction applications a unique wavelength is utilized. The UV light penetrates the outer cell wall of the microorganism, passes through the cell body, reaches the DNA and alters the genetic material. The microorganisms are thereby destroyed in a non-chemical manner (Figure 1). The 254nm UV light is also used to destroy residual ozone present in a water stream. The 185nm UV light, utilized in TOC reduction applications, decomposes the organic molecules. The 185nm light carries more energy than the 254nm light. The 185nm light generates hydroxyl (OH·) free radicals from water molecules. The use of UV technology for water treatment has several inherent advantages. UV light does not ‘add’ anything to the water stream such as undesirable color, odor, chemicals, taste or flavor, nor does it generate harmful by-products. It only imparts energy to the water stream in the form of UV light to accomplish the process of disinfection, TOC reduction, ozone destruction or chlorine/chloramine destruction. UV disinfection produces no residual disinfectant to the finished water. Our systems feature low pressure mercury discharge lamps. The lamps are constructed with a special quartz envelope material that looks like glass, but is actually a discriminating filter. This unique design allows predominantly 254nm or 185nm UV energy to be transmitted into a water stream as it flows through the UV system’s treatment chamber. The primary uses of UV for water treatment are: Disinfection, Ozone destruction, TOC Reduction and Chlorine Destruction. UV irradiation can be used for multiple purposes in water treatment, but is primarily employed as a disinfection process that inactivates waterborne pathogens without chemicals. For other applications, UV is used for the removal of organic and inorganic chemicals, including chlorine, chloramines, ozone and Total Organic Carbon (TOC). When combined with oxidants such as ozone or hydrogen peroxide, or semiconductors such as titanium dioxide, UV can be used for the oxidation of refractory chemicals such as chlorinated solvents, taste and odor compounds, and other emerging contaminants. Our UV systems incorporate multiple lamp technologies such as low-pressure and medium-pressure; multiple lamp orientations such as horizontal and vertical. The design of an ultraviolet sterilizer has an extremely important bearing on how the UV Dose is delivered and Dosage is the most critical function of UV disinfections. As individual UV lamps emit a set amount of ultraviolet energy, it is important that a system be sized correctly. Flow rates are the determining factor and must not be understated. Contact time, which is the time the water is within the sterilization chamber, is directly proportional to Dosage, which is the amount of energy per unit area (calculated by dividing the output in watts by the surface area of the lamp), and thus the overall effectiveness of microbial destruction in the system. This product of intensity and time is known as the Dose and is expressed in microwatt seconds per centimeter squared (uWsec/cm2). Divide by 1000 to express the dose in mJ/cm2, the preferred notation. For maximum UV transmission a “hard glass” quartz sleeve is recommended for two main reasons. It isolates the lamp from the water to offer more uniform operating temperatures and allows for higher UV output into the water. A variety of optional features may be added on to the UV sterilizers. They include UV monitoring devices that measure the actual UV output, solenoid shut-off devices that will stop the water flow in the event of a system failure, flow control devices to properly limit the water flow in the units, audible and visual alarms (both local and remote) to warn of lamp failures, high temperature sensors to monitor excessive temperatures in the reactor chamber or control panel, and hour meters to monitor the running time of the UV lamps. Chemical-free technology. Environmentally friendly, eliminating chemical transport, storage, handling or removal, no problem of overdosing it’s impossible). Because UV does not leave any measurable residual in the water it is recommended that the UV sterilizer be installed as the final step of treatment and located as close as possible to the final distribution system. Once the quality of your water source has been determined, you will need to look at things that will inhibit the UV from functioning properly (e.g., iron manganese, TDS, turbidity, and suspended solids). Iron and Manganese will cause staining on the quartz sleeve and prevent the UV energy from transmitting into the water at levels as low as 0.03 ppm of iron and 0.05 ppm of manganese. Proper pretreatment is required to eliminate this staining problem. Total Dissolved Solids (TDS) should not exceed approximately 500 ppm. There are many factors that make up this equation such as the particular make-up of the dissolved solids and how fast they absorb the sleeve, again impeding the UV energy from penetrating the water. Turbidity is the inability of light to travel through water. Turbidity makes water cloudy and aesthetically unpleasant. In the case of UV, levels over 1 NTU can shield microorganisms from the UV energy, making the process ineffective. Suspended Solids need to be reduced to a maximum of 5 microns in size. Larger solids have the potential of harboring or encompassing the microorganisms and preventing the necessary UV exposure. 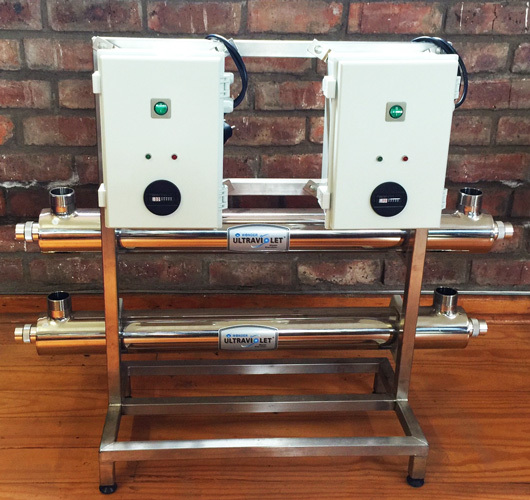 Pre-filtration is a must on all UV applications to effectively destroy microorganisms to a 99.9% kill rate. Additional Factors affecting UV is temperature. The optimal operating temperature of a UV lamp must be near 40°C (104°F). UV levels fluctuate with temperature levels. Typically a quartz sleeve is installed to buffer direct lamp-water contact thereby reducing any temperature fluctuations. Once the application has been determined, you should find a location that offers easy access for service. You will need to have access to the pre-filters, to the UV chamber for annual lamp changes and regular maintenance on the quartz sleeve. You will want to locate near an electrical outlet. *Note: Using a UV system and a pump on the same electrical line may cause problems with and shorten the life of the UV lamp and ballast. UV units should be installed on the cold water line before any branch lines and should be last point of treatment. All points of the distribution system after the sterilizer must be chemically “shocked” to ensure that the system is free from any downstream microbial contamination. Lamp changes should be done at least once every year. Do not leave fingerprints on the glass! It is imperative to follow the manufacturer’s guidelines on water quality and operational procedures. The need for ultraviolet sterilization products can be found in virtually all areas in both residential and commercial applications alike. Its simplistic design, ease of maintenance and low capital and operating costs make UV the number one choice in contaminated water situations. Health professionals and water specialists are becoming aware of possible side effects of chemical sterilizers and their resultant chemical by-products. Because of its advantages, UV irradiation should become a very popular choice for the disinfection of water supplies in the 21st century. Next time, purify water “nature’s way” …use ultraviolet light.